Long waits at unfamiliar airports can be a painful experience. So, if you find yourself stuck at Toronto Pearson International Airport, here are some of the best ways to while away the time. Not that an excuse is ever needed to indulge in a manicure, but surely long layovers are the perfect excuse to clean up those cuticles. Located in Terminal 1 at Toronto Pearson International Airport, 10-Minute Manicure also offers massages and teeth whitening. The only hotel located right within the Toronto Pearson International Airport, the Sheraton Gateway Hotel in Toronto International Airport allows tired travelers the chance to revive with a sleep, swim, shower, and workout. Day use rates are available. A layover of more than 7 hours should afford you the time to head into Toronto and see some of its attractions, like the CN Tower. If you rent a car, you may even have time to see Niagara Falls, which is 90 minutes away with no traffic. If you have luggage to deal with, check it at the Travel Store located on the Departures Level of Terminals 1 and 3. Keep in mind also, that if you need to clear customs, you will need to build that time in and it can be a long wait at Pearson. And one more thing to think about before departing the airport is whether you may be traveling on a busy Canadian holiday, such as Thanksgiving (different date than in the U.S.) or March Break. If you want to tour Toronto on your own, public transportation is possible and cheaper but will take longer than a cab and may cause you extra stress if you have major time constraints. eTours.ca offers 2.5-hour tours of Toronto and will pick you up and drop you off right at the airport. Several airport lounges are available to passengers at Toronto Pearson International Airport who either qualify through airline affiliation or who are willing to pay a flat fee for use. Terminal 1 features three Air Canada lounges, all of which serve hot and cold food, alcohol, showers, free wi-fi, magazines, newspapers, televisions, and computers. If you're not an Air Canada eligible member, you must purchase your lounge pass with your ticket. KLM, British Airways, and American Airlines also have lounges and 5 Premium Plaza Lounges, which are available to anyone willing to pay, are in Terminals 1 and 3. As part of its long-term strategy to be more than just a vehicle through which people are shipped from one destination to another, Toronto Pearson International Airport is boosting its cultural identity - in part by displaying permanent art installations. Terminal 1 features eight permanent and several changing exhibitions as well as two impressive dinosaurs skeletons, courtesy of the Royal Ontario Museum. You can easily fill an hour seeking out the airport's full art catalog or make a game of it by asking your kids to find them. 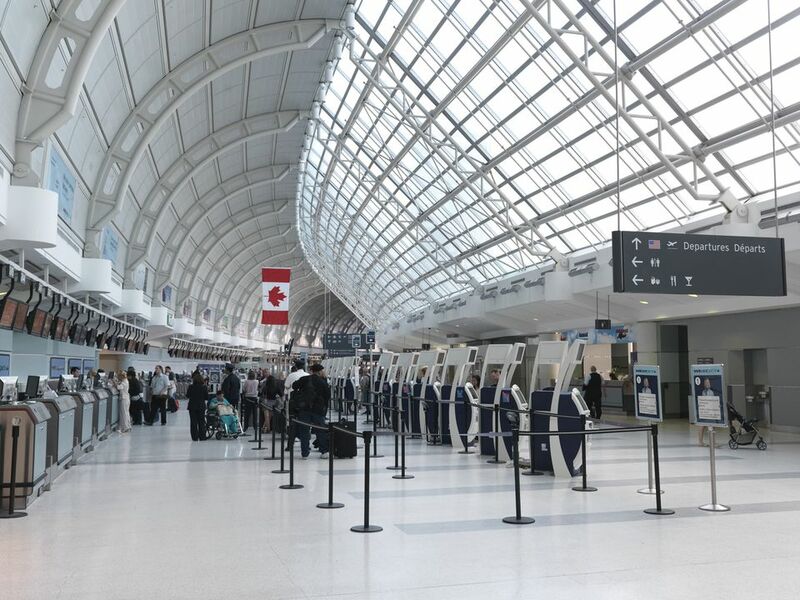 If you don't want to pony up the cash for a hotel, the spaciousness of Toronto Pearson International Airport affords plenty nooks and crannies for tired travelers to grab a little shut-eye. Lots of ways to spend your cash between flights at the duty-free shops that line Toronto Pearson International Airport's two terminals - though Terminal 1 has the lion's share. Many high-end retailers have set up shop at Pearson's renovated Terminal 1, including Gucci, Burberry, Coach, and more. The most popular duty-free items are jewelry, perfume, luggage, chocolate, souvenirs, and alcohol. Keep in mind that duty-free shopping at an airport is not necessarily cheaper than at other stores. Often store rental costs are high and so the full savings aren't passed on to customers. If you have a few hours to kill and don't mind leaving the airport property, Square One Centre, one of the largest shopping malls in the country, is under one hour away by public transit - no transfers and the bus leaves right from Terminal 1. Playdium, a 40,000 sq. ft. indoor complex features more than 200 high-tech attractions, rides, and simulators, is right next door to Square One Centre. In 2013, Goodlife Fitness opened a gym in Terminal 1. For a flat fee, travelers can get a workout boost using the facility's cardiovascular equipment, free weights, and strength training equipment. Don't have work out clothes? Shoe and clothing bundles are available to rent. Luggage storage is free. Toronto Pearson International Airport has several small children's play areas in terminals 1 and 3.